I know, I know. Two zucchini recipes in a row. 'Tis the season. :) But! This is yummy enough to have earned a spot on our table twice in the last two weeks, so I feel I really must share it. It's such an easy and versatile dish and the cooking method so quick and almost fun that I'm regretting not trying it before. Any way you make it, dinner/breakfast/lunch/brunch is on the table in about 20 minutes, including prep time, and I appreciate that because school and housekeeping have been keeping me plenty busy. In the interest of full disclosure, that sense of busyness has been artificially amplified by an old copy of Emma by Jane Austen (original retail price: 50c!) and the activity of getting my 17-month-old son down from places, because although he's not quite walking yet, he has taken to acting like a daring little mountain goat. Emma I picked up at a library bag sale last week ($3 to fill a large paper bag at the sale, so we came home with at least a hundred children's books and movies, audio books, and a few more classic titles) and I had my nose buried in it every free moment until I finished it and was able to satisfy myself that though no one slaps Mrs. Elton like I wanted to for most of the story, things do resolve nicely for everyone else. I made this in a 12" cast iron skillet the first time we had it, and because there were no leftovers, a 14" skillet the second time. The first time I had added some crumbled bacon, the second time we had some sausage, peppers, and onions leftover from another meal, so I chopped those up and added them after the zucchini was cooked instead. 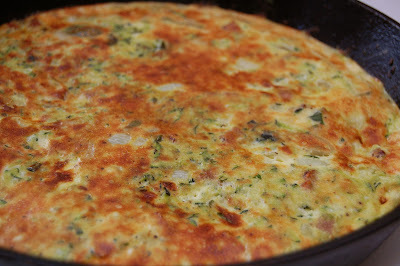 For the larger pan, I increased the amount of eggs and milk and made my herb measurements heaping ones. In other words, play is allowed...you could saute a tomato, bell peppers, eggplant, or mushrooms with the zucchini, use ham or prosciutto as the meat, or leave the meat out completely. Whisk together eggs, milk, Parmesan, salt, pepper, and herbs. Set aside. 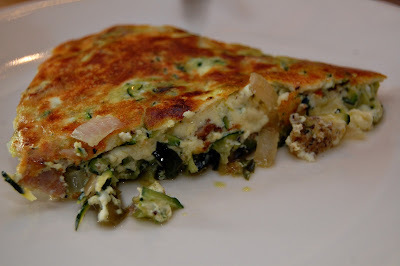 In a cast iron skillet, saute zucchini, onion, and garlic (and other vegetables, if using) in a few tablespoons of olive oil until zucchini is soft and onion is soft and translucent. Spread vegetables evenly over bottom of skillet. Pour egg mixture over top of zucchini and allow to cook undisturbed on medium heat for about 5 minutes. Transfer the skillet to the oven, about 6-8" from the heating element. Broil 5 minutes, or until top has browned and frittata has set. Watch it closely so it doesn't burn.